It's finally FRI-YAY! I feel like the weeks are going by slower and slower these days so I'm super excited for the break this weekend. I wanted to share this look today because it seems to be an easy weekend outfit for me. Everything I am wearing is 100% comfortable, and to me- that is essential. Keep in mind that simple outfits often times speak the loudest. What I mean by this is that sometimes your plain tees paired with jeans can look cuter than an "over the top" outfit. 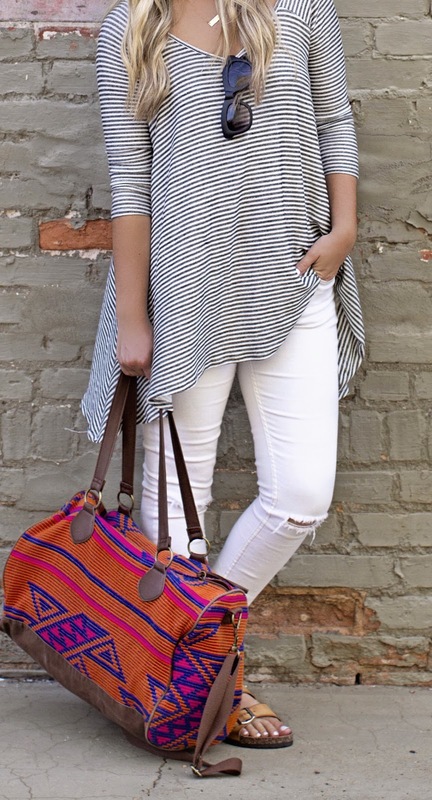 I always like to pair plain loose tees, jeans, and sandals with a hat/colorful bag to give the look a little somethin' extra. This way I can be comfy, yet cute. I bought this weekender bag from Target awhile ago when they first started carrying them, and I literally use this bag all the time.. especially on weekends. The bag has so much room but doesn't look humungous. Since then, Target has come out with so many more that I am obsessed with. I listed my top favorites below! Wishing you guys a happy weekend!